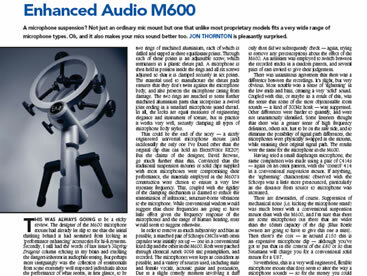 Click here to read the Resolution Magazine review of the Enhanced Audio M600, reviewed by Jon Thornton. 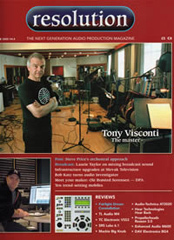 "Not just an ordinary mic mount but one that unlike most proprietary models fits a very wide range of microphone types. 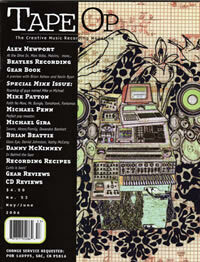 Oh, and it also makes your mics sound better too." The first time I saw this sucker, I was a little skeptical. Why does just about every large-diaphragm condenser mic come standard with a suspension shockmount ? Because a shockmount isolates the mic from vibration and therefore "enhances" the mic's performance… or so I thought. The M600 takes the opposite approach. It uses six screw-down clamps to hold the body of a mic solidly within the center of two low-resonance aluminum rings. This thing is massive. (You need a serious mic stand to hold it up.) And even though you're only finger-tightening the clamps, the mic ain't goin' nowhere. Even the assembly to adjust tilt is super-solid. Once you tighten it, the heaviest of mics will stay in position. My only gripe about the physical design is that even with two hands, it's hard to get all the clamps aligned onto the mic body (being careful not to use too much force). Even the tilt control requires the finesse of both hands. But once it's all adjusted and you've got your mic in place, get ready for a serious revelation. My first use of the M600 was to hold a Groove Tubes GT50 FET in front of my studio kick drum. I was blown away by how tightly focused the thump of the kick sounded and how nicely the drum resonated. But still skeptical, I carefully marked the position of the mic and swapped out the M600 for the GT50's suspension mount. A good deal of clarity went away. I switched back to the M600, and that focus was definitely back. My skepticism disappeared. I should state here that I was using a Seventh Circle Audio A12/SC25 mic preamp and listening on ADAM S3A monitors with a Bag End InfraSUB‑12 Pro subwoofer in my well-tuned control room. The other thing I noticed was that I could turn up the volume much higher before the Bag End's dynamic filter kicked in because there was less infrasonic energy (below 20 Hz) in the sound. I tried further tests with a GT60 tube condenser on vocals, and again, I could hear a difference in focus. Bass and guitar amps? Yup. I also did some comparisons with non-suspension mic clips, and here too I could here a difference, although the change in clarity was a bit more subtle. I think that the M600 is accomplishing two things. First, it prevents the mic from vibrating infrasonically due to extreme changes in air pressure or even from direct blasts of air. This prevents smearing (modulation) of the frequencies the mic is supposed to be picking up. Second, it prevents the mic from resonating at frequencies within the range of the sound it's capturing, thereby reducing mud. So there is some real science behind it, but your first reaction after seeing the $275 street price might be that science doesn't come cheap. Well, think of the M600 as something that can upgrade the sound of every single mic in your cabinet, and you'll realize what a great deal it is! 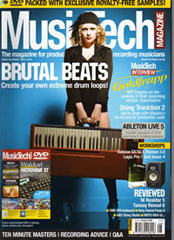 MusicTech magazine (August 2005 issue 29) has presented the Enhanced Audio M600 a 9/10 recommended Award. 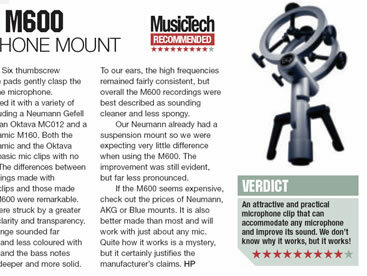 "The differences between the recordings made with standard clips and those made with the M600 were remarkable. The midrange sounded far smoother and less coloured with the M600 and the bass notes sounded deeper and more solid."